Perfectly positioned in the Fourth Ward neighborhood of Uptown Charlotte, and just steps from Gateway Village, this community offers sweeping views of the downtown skyline and so much more! Take advantage of our free bike share and cruise over to Romare Bearden Park and First Ward Park, or enjoy a scenic path along the Rail Trail as you head into South End. 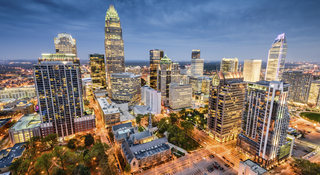 If you’re a sports fan, tailgate and cheer on the Carolina Panthers at Bank of America Stadium, feel the buzz of the Charlotte Hornets at Time Warner Cable Arena, or root for the home team at BB&T Ballpark, home to the Charlotte Knights. If you’re a foodie, indulge in culinary delights around Cedar Flats at notable restaurants like Halcyon, 5Church, and Aria. With AvidXchange Music Factory and the Comedy Zone nearby, you’ll never be bored when you live at Cedar Flats. Even better, your favorite music acts make it a must to frequent The Fillmore and Uptown Amphitheatre. From dancing shoes to bowling shoes, you’ll find an array of fun at the Epicenter, and if a taste of art and culture are your thing, Uptown serves up an array of options from the Bechtler Museum to Blumenthal Performing Arts.